Twenty years ago on a beautiful November day, Robert Bonnie and Dominick DellaSala got an unexpected and unforgettable opportunity to play hooky. Both were working for environmental groups, Bonnie for the Environmental Defense Fund and DellaSala for the World Wildlife Fund. But when they arrived at Yellowstone National Park for a meeting about large carnivores, they learned that the park was closed and their meeting had been canceled: The federal government had just shut down over a budget battle between President Bill Clinton and Congress. Somehow, they talked their way into the park anyway and hiked through Lamar Valley, peering through binoculars at newly reintroduced gray wolves and distant grizzlies and watching a peregrine falcon circle overhead. Years later, Bonnie recalled that adventure when he and DellaSala met at the Agriculture Department's Washington, D.C., headquarters to discuss the fate of the Tongass National Forest in Southeast Alaska, the nation's largest national forest and the last where large-scale clear-cutting of old-growth trees has been permitted. Bonnie, now the undersecretary of Agriculture who oversees the Forest Service, said that day had been one of the best of his life. DellaSala challenged Bonnie to top it by saving the Tongass. "That would be a conservation legacy," DellaSala, 59, recalls. Now, however, three years later, Bonnie and DellaSala are on opposite sides of a battle over climate change and the Tongass. 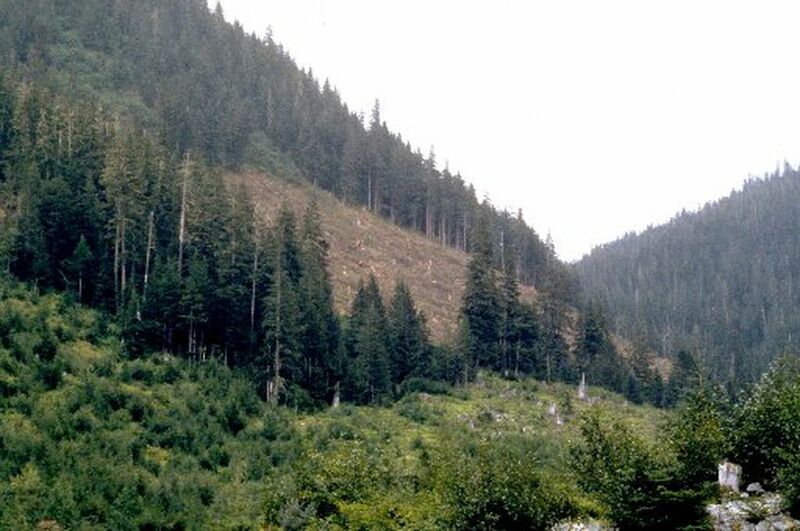 By the end of the year, the Forest Service expects to finalize an amendment to the 2008 Tongass Land and Resource Management Plan that would phase out large old-growth clear-cuts over 16 years. "We are being very forward-leaning here," Bonnie, 48, says. DellaSala vehemently disagrees. He's now the chief scientist of Geos Institute, a small Oregon-based group of scientists and policy wonks who work with land and water managers and communities on climate change. DellaSala believes the Forest Service and Bonnie in particular should end old-growth logging across the 17 million-acre forest much faster — not just for the sake of the ancient Sitka spruce, cedar and hemlock, but for the planet. The Tongass' rainforests cover an archipelago of Alaska islands replete with waterfalls and glaciers, and DellaSala fell in love with the area while doing field research in the 1990s on the impacts of logging on wolves, Sitka black-tailed deer and songbirds. DellaSala now is promoting a plan — supported by many environmental groups and former Forest Service leaders — to phase out clear-cutting in five years. "It's disappointing that we have a president who is so engaged on climate change and an agency that is so unsavvy," DellaSala says. "It's not in step with the rest of the administration's global leadership on climate change." A quicker end to clear-cutting old growth could also protect habitat for wildlife, including five species of salmon that are key to the region's economy. Logging in the Tongass is already down to about a 10th of what it was when Bonnie and DellaSala played hooky in the mid-'90s. And climate change may prove to be the force that ends wide-scale old-growth logging there permanently. "Although the transition time frame is too long, when you look at the long and twisting timeline of Tongass management, the fact (that) we are now talking openly and clearly about the end of old-growth logging and road building is a significant, positive event," says Tim Bristol, a longtime environmental advocate in Southeast. The turning point came in November 2009, when world leaders gathered in Copenhagen to negotiate a new international climate treaty. U.S. Agriculture Secretary Tom Vilsack highlighted the "vital role" forests must play in combating climate change, singling out the Tongass, which may hold as much as 8 percent of all the carbon contained in America's forests. Bonnie, as Vilsack's climate change adviser, was listening just off-stage and felt tremendous pride: His work had long focused on the ability of forests to store immense quantities of carbon and blunt the impact of greenhouse gas emissions. Four years later, Vilsack directed agency staff to speed the transition away from old-growth logging in the Tongass while sustaining timber industry jobs. The Forest Service convened an advisory committee of representatives from industry, local tribes and regional environmental groups to come up with a plan, no easy task given that logging there has been roiled for decades in court battles and high-stakes politics. Alaska politicians led by Republican Sen. Lisa Murkowski, head of the Senate Natural Resources Committee and the Appropriations Subcommittee, which provides the Forest Service's budget, constantly pressure the agency to increase the availability of massive old-growth logs, most of which are shipped to China, South Korea and Japan. But environmentalists regularly challenge such timber sales. The agency believed that a plan produced with strong local input could survive political attacks and changes in leadership in Washington. DellaSala's quicker phase-out was rejected as too risky for industry. Bonnie says it also would be risky politically; it assumes that a possible future Republican administration wouldn't reject it and that the formidable Murkowski wouldn't block it. Last year, the committee voted unanimously to support a transition from logging old-growth to second-growth timber over 10 to 15 years. Second-growth areas support less wildlife, and since they already have been cut, logging them again doesn't require building new roads. The timber industry, state government and the tribal timber organization attacked the plan, saying it wouldn't allow enough old-growth logging to keep them in business. The market for second-growth trees is uncertain, too. The proposal "will result in the bankruptcy and the closing of all major timber operators on the Tongass," Eric Nichols, a partner of Evergreen Timber and Alcan Forest Products, wrote to the Forest Service. The Forest Service didn't do its own calculations, despite guidance from the White House Council on Environmental Quality that agencies should do so. In its environmental impact statement on the proposed plan, the agency downplays the impact of logging in the Tongass. "Emissions from harvests in the Tongass are very, very small relative to other sources," Bonnie says, such as deforestation in the Lower 48 and emissions from automobiles and power plants. Jim Furnish, a former Forest Service deputy chief, knows that transitioning away from old-growth logging is hard but doable. He oversaw the end of large-scale clear-cutting in the Pacific Northwest after the courts ordered the agency to save habitat for the northern spotted owl. He and DellaSala have told Bonnie and others at the Forest Service that the reasons for saving the Tongass could not be more compelling or more consistent with the Obama administration's principles. Furnish keeps telling them it's "a huge carbon treasure chest. But we're not getting any traction with that." Bonnie deflected repeated questions about why his agency failed to assess its Tongass plan's emissions or the projected costs of that carbon pollution for current and future societies due to fiercer storms, rising seas, more destructive forest fires and the other negative effects of climate change. The White House's guidelines, first released as a draft in 2010 and finalized in August, don't require agencies to quantify the greenhouse gas impacts of their actions, but recommend that they do. Bonnie stresses that while the Forest Service has prioritized climate change in this and many other decisions, by law it also has to consider impacts on rural communities and jobs. The agency's push for the industry to switch to second-growth timber comes after two decades of forest policy from Washington that dramatically shrank the local timber economy. Companies now cut about 40 million board-feet, down from a peak of nearly 600 million, and timber jobs are down 80 percent. Under the Forest Service's proposal, the Tongass would support about 200 direct timber jobs, an increase from current levels. During a tense hearing on Capitol Hill in March, Murkowski asked the agency to delay the transition from old growth to save jobs. But Forest Service Chief Tidwell believes the phaseout will ultimately reduce opposition to logging and help the beleaguered industry sustain itself. There's already been, he said, "two decades of controversy and litigation around old-growth harvest and roadless (rules), and that's gotten us nowhere." He promised new markets for the smaller second-growth trees that would be logged instead. Murkowski shot back: "New markets are good, chief, but you still have to have trees that are mature enough to harvest." Now, Murkowski is pushing a bill to derail the proposed transition from old growth. The Forest Service held meetings in Ketchikan and Juneau in October to consider objections from all sides. Bonnie says he feels confident that the agency's blueprint will weather the criticism because the phaseout makes sense for the ancient trees, the community and the climate.